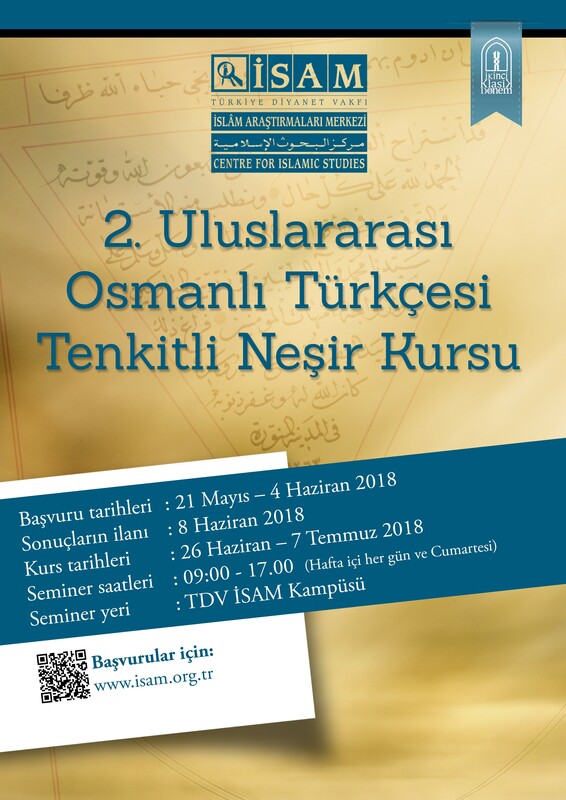 The 2nd International Ottoman Turkish Critical-Edition Course will be organized within the scope of Late Classical Period Project of the Centre for Islamic Studies. From 26th of June to 7th of July 2018 participants will receive training from the experts, consisting of the necessary knowledge and skills to study on Critical-Editing of manuscripts in Ottoman Turkish. Throughout the course, participants will be given theory-oriented seminars followed by practise-oriented seminars every day. At the end of the course, participants will be expected to submit a work on Critical-Edition regarding the training. Those who have perfect attendance and meet the requirements of the practice stage will be awarded a certificate. 1) Application and Admission: Applicants who are enrolled into an MA, MSc or PhD program may submit an application for the course. Those who are currently studying on the Critical-Edition of an Ottoman Turkish will be prioritized. For those who are doing their masters will be expected to be in their dissertation year. 2) Course Language: All courses will be in Turkish. Applicants are expected to be qualified in reading manuscripts in different Ottoman Turkish styles. 3) Practice Stage: In this stage of the course applicants will practice Critical-Editing on a selected section of a manuscript. Therefore, applicants will be expected to have a laptop and use transcription signs. 4) Course Fee: The applicants will not be asked any fee for the course. 5) Transportation, Accommodation and Meals: Applicants’ transportation and accommodation expenses will not be compensated by ISAM. Lunch will be provided by ISAM to applicants during the course duration. 6) Announcement of Results: The applicants will be informed via e-mail about the results. Make sure your contact information written in the application form is correct and up to date. Click to apply for the course.